Like most four year olds, Gavyn Boscio knows what he wants for Christmas - a dinosaur and an Easy Bake Oven. But the budding chef and his 13-year-old sister McKenna Pope, weren't thrilled to find out the only colors the Hasbro oven comes in are pink and purple or that the ads and packaging don't show a single boy. McKenna decided to take the issue into her own hands and began a petition on Change.org asking Hasbro to alter its packaging and color options. To date, the petition has garnered nearly 10,000 signatures. "He should know that it's okay for him to go against societal norms and gender roles," McKenna said. Hasbro did not immediately return requests for comment on whether they plan to make the Easy Bake Oven in any other colors. Jeff Gardere, a child psychologist, said gender neutral toys are crucial to child development. "In order for children to not face limitations in their occupational choices, we need to present them with gender neutral toys," he said. This holiday season, overly-gender-specific toys are a hot button issue. The Butterfly Beauty Shop from Lego's Friends line has drawn the ire of a group called the Campaign for a Commercial-Free Childhood. They've nominated it for one of their "TOADY" (Toys Oppressive And Destructive to Young Children) award, saying it's "so jam-packed with condescending stereotypes it would even make Barbie blush." Lego did not immediately respond to a request for comment. But previously, in response to the criticism which began late last year, Lego officials said in a statement that their "goal with LEGO Friends is to engage more girls in the positive benefits of construction play." In contrast, in Sweden, the Top Toys group just published a catalog of gender-neutral toy images, showing girls playing with toy guns and boys with blow dryers. 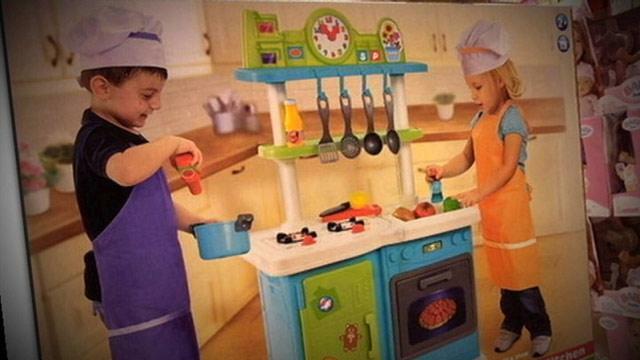 The company is even selling a blue and green kitchen, and depicts a budding chef, a boy like Gavyn, using it.